A bridge not too far, but quite far enough (while on foot) – The Diesel-Electric Elephant Company. “On foot” is such a peculiar phrase. I rarely restrict myself to just using the one to get about. I know that two is probably an indulgence but, well, whenever I’ve tried hopping folk tell me that I just bring to mind an elderly kangaroo that has just stepped on a Lego brick, and that’s no good to anybody, is it? Talking of any body, my magnificent body – and I know that you won’t believe this – is actually made up from spare parts that my parents found or bought. My legs, for instance, are an almost-matched set from a house-clearance auction in Mablethorpe, the left one apparently the kind legacy to the late home-owner of a steeplechase jockey who snuffed it in a bar-brawl in the early fifties, and the right leg an unused spare that was carried around for decades by roadies working for the All-In Wrestling Federation of Eastern Europe. In order to stop the hip-bolts going rusty I must exercise them daily (or at the very least, twice a lunar month) or else they seize up and I can no longer stand on tip-toe to reach the biscuit barrel. To make the walks worthwhile I use them to reconnoitre the land fore and aft, basically to see what it is that I may be disturbing, scattering and generally setting the cat amongst when I do move the boat. Yesterday I went around the bend at Barbridge Junction (well, doesn’t everybody?) and hot-feeted it up to Bridge 102 on the way towards Chester. A workhorse under the A51. I mean, not literally, not some sort of equine burial. I was being metaphorical. Oh, please yourself. Bridge 102 on the Shropshire Union is a peculiar place. Most bridges over the canals that I have seen to date are lovely, ancient stone-arch affairs supporting narrow roads that once thought a brewer’s dray to be the zenith of demands placed upon them, but that now labour under John Deere and articulated Scania. Bridge 102 is a modern bridge, built to carry the A51 with its regular thunder of heavy nonsenses being transported left, right and centre at all hours. The A51 goes where it will, it is the much older canal that, in this case, in a sense gives way by snaking under it in an “s-bend” so that the road may remain straight. What a jolly jape, to put a double-blind s-bend under a bridge. How we boaters laughed and laughed and laughed. Walking under the beast though is a different matter. The tow-path leading to it from the Barbridge side is soggy, so soggy in fact that had I not been gifted the wide, flat feet of a prize-winning Innuit dog-sledder I should have disappeared in the mire up to Margot Fonteyn’s waist (another generous gift, during my parents’ collections and soon after the funeral, from the Royal Ballet). To be under the bridge though is to be in such a solid construction of concrete and (doubtless) steel reinforcing as to feel bomb-proof. Bridge 102 is not a delicate thing, it doesn’t even rely on the arch for its strength, resting assured in the strength of great slabs of modern materials with straight beams and only token buttressing. The tow-path, while wide, is low and is formed of a deliberate corrugation of tiles, a pattern that I assume, generously, to be to provide grip to bare-foot trolls, rather than the design-jest of a draughtsman giggling over providing a trip hazard for pesky humans each and every nine inches. One can never be certain though, can one? The canal water that flows very, very languidly under the bridge is actually the colour of – and let’s be polite here, you may be eating – seven shades of building-site tea or a poorly-made Mulligatawny. Once in the shade of the construction though the eye is deceived and for all that my brain could make out (thank you, Chester Zoo’s chimpanzee department) the water might be crystal clear and showing bottom*. * “Showing bottom” is fine for water, but should never be undertaken by humans, carrying as it does to my certain knowledge an eight shilling fine, a criminal record and several withering looks from a Magistrate, no matter that Grimsby Town FC had scored an amazing goal within the first two minutes of a less than friendly match against Hull Brutes, or whatever their team is called. Turn the image downside up and it’s even more confusing to the eye. Yes, you didn’t know it at the time but, a couple of days ago, while you were doing something sensible and domestic, I was under a bridge considering what it all looked like when upside down. There’s no accounting for humans, is there? Viewing the contruction while standing on one’s head (thank you, Igor and Mr A.B. Normal of No. 2, The Laboratories, Marmaduke Drive, Slough) is even more confusing. I took my chances and guessed that no-one would be passing while I stood on my head under a bridge. Anyway, whatever way up the bridge was, that was the farthest reach of that day’s explorations, and I collected my senses (there’s the work of a couple of micro-seconds in one simple phrase) and made my way home to the Cardinal. The exercise must be regarded for the purposes of the boat’s log as “successful”, since on reaching home I had little to no trouble reaching for the biscuit barrel. Ah, life’s rich, moth-eaten tapestry eh? I have no idea why I am constantly surrounded by moths, it can only be the relatively high wool content of my soon-to-be-removed-and-washed winter longjohns, I suppose. Previous Lazy, hazy, Sundays full of mooching around and reading, afloat. What a strange and delightful world you live in! I do love to hear how you manage to wander along the canals and byways on your adventures. Keep chugging along, good fellow! I have to go and lie down now, those images have messed with my balance! I’m sure if you issue a loud ”Toot’ on an instrument of your own choice before tackling he bend you will achieve right of way if not right of passage Ian. You may hear the faint tones of the ‘ Landlubbers Lament’ as you pass under your bridges and we see your ‘back end’ disappearing in the distance. Cheers, Muskie! My boots have dried out now after that jaunt! 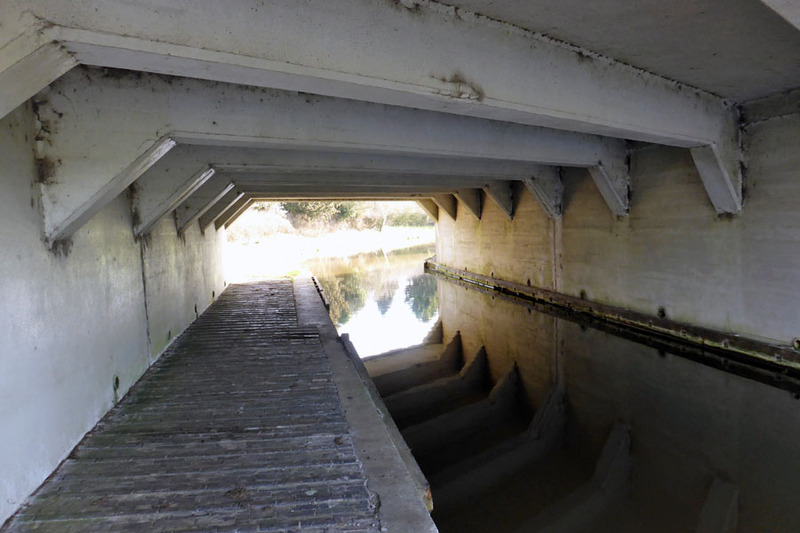 This latest post by my favourite Salty Old Sea Dog, Ian Hutson, takes us on a photo tour of a bridge spanning a canal he must navigate – quite entertaining! You’re welcome, Ian. I always leave your posts with a big smile! Ah, you have excelled today (it’s amazing what a biscuit or two can do for the pen) and I confess to tittering a time or two. What a lovely start to this springlike day with the threat of that there storm over the pond likely to descend at the weekend. Nevermind, at least it has buffered my need to wean myself off biting the ears off Malteser chocolate bunnies which has become an addiction of late. I just love engineering though, it must be so much easier to take a long boat through and round that blind s bend than to drive a car or jugticular down a curving road, for heaven sake they would have to slow down a tad! Highways dept 15 v canal’s dept 0 – new balls please!